Product prices and availability are accurate as of 2019-04-21 23:07:29 UTC and are subject to change. Any price and availability information displayed on http://www.amazon.com/ at the time of purchase will apply to the purchase of this product. 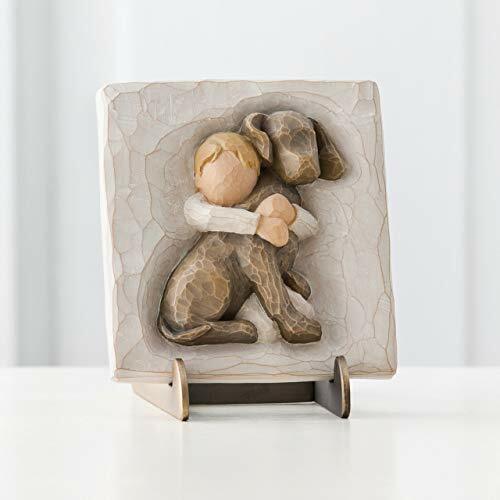 The Willow Tree Hug Plaque is a beautiful hand-painted plaque of a boy embracing his dog and can be paired with the plaque stand. This would make a very special memorial or keepsake gift for someone who's dog is no longer with the living. 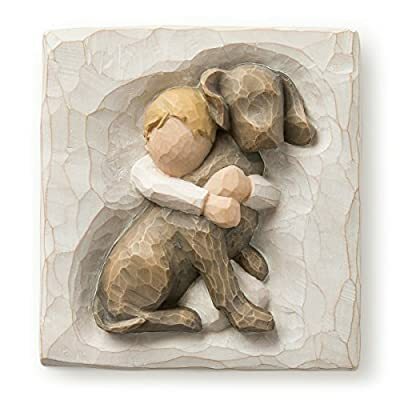 An expression of friendship and love of pets in a carved bas-relief hand-painted plaque that can hang on the wall or be displayed on plaque stand (sold separately). create a wall display with several plaques of similar size and expression. A gift of Willow Tree communicates beyond words. Sentiment on enclosure card: A boundless love 4"sq x .5"d hand-painted resin bas-relief plaque. Keyhole hanger for wall display, or use Plaque Stand #26500 (not included). Dust with soft cloth or soft brush. Avoid water or cleaning solvents Artist Susan Lordi hand carves the original of each Willow Tree piece from her studio in Kansas City, MO. This piece is cast from Susan's original carving and painted by hand Willow Tree is an intimate line of figurative sculptures that speak in quiet ways to heal, comfort, protect and inspire.